There's something about the internet that makes people believe stupid things. Obama raised taxes. Vaccines cause autism. The Republican party is good for America (or even "not actively bad" for America). Go to Facebook and unblock those aunts or uncles or grandparents that you never pay any attention to, and look at the idiotic things they fave and reshare. But not even geeks are immune: one of the most persisitent rumors is that "today is the day Marty McFly travelled to in the future!" It's been happening since at least 2005, and will probably only increase in the next few years. Today, as I write this review, it's February 1, 2010. 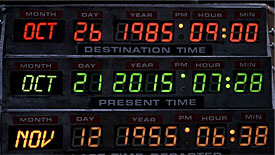 The future date that Marty McFly goes to is October 21, 2015 - more than five years away. That's also when we're going to post this review (unless we forget it exists between now and then). It's like time travel, in a way! Join Marty McFly for the adventure of your life with this timeless two-pack from the 2015 era featured in the hit "Back to the Future" franchise! This set is based on Back to the Future Part II; specifically, on the section set in 2015. 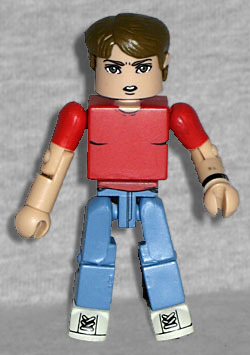 Our first figure is Marty McFly - the teenage one who was visiting from 1985, not the adult one who got there the old-fashioned way (aka, one day at a time). It makes you wonder when changes to the timeline become "real" - after all, if Young Marty grew up to become Old Marty, shouldn't Old Marty remember the day that he came to the future? How long does it take for the new history to set and overwrite the old one, and is it a function of how far away you are from the point of change? You know, like if you change something a week ago, it happens almost immediately, but things from 30 years away take a little time to wash up on the shore? This is Marty after he changed out of the future clothes Doc gave him, so he's wearing the same outfit he's been wearing since 1955: white sneakers, blue jeans, and a red T-shirt. Really, BttF2? You expect us to believe that in the future, "jeans and a T-shirt" will still be normal, unobtrusive clothing? Unlikely! Actually, he was wearing this under his regular 1985 outfit, under his 2015 jacket, while he was running around the Alternate 1985, and under his 1955 stealth suit. It really gets around! He's painted with a watch on his left wrist, and since they couldn't very well paint Nike swooshes on his shoes, he just has some red stripes. The face is a little bit cartoony, to suggest Marty's youth, and the hair is a new piece used just for him. It's parted on the right, and has a big split in the bangs. His eyes appear to be grey. Does Michael J. Fox have grey eyes? Google says he doesn't. The look on his face is slightly dumbfounded, which would really work for any of the three time periods when he wears this. 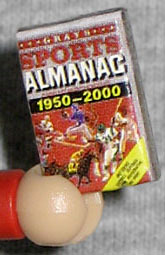 Our second figure is much easier to pin down to a specific time: Future Biff Tannen. Okay, two specific times. This sad old Biff definitely originated in 2015, but he was also clomping around in 1955 for a while - and that brings us back to the question of how long it takes for changes to catch up with you: in a deleted scene, Biff dies when he gets back to the future because he'd been shot in the (alternate) past. So the past had already caught up to him, but not to the rest of the world? Maybe it happened when the Delorean travelled through the time when it happened? SO MANY QUESTIONS! Future Biff definitely dresses like an old man. 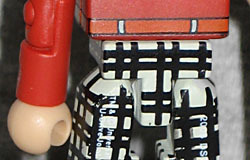 He's wearing black and white checkered pants, and has the belt pulled up almost all the way to his armpits - even the Minimate gets in on the action, by painting his orange belt on the chest block instead of around the waist. His long-sleeved shirt seems to be red crushed velvet, and his shoes are the same orange as his belt. It's possible that's supposed to be brown - it's hard to make a good brown, so it might have just slipped into orange accidentally. A lot of the "old age" makeup in Back to the Future Part II was kind of silly (especially the upside down not-Crispin-Glover), but it's kind of uncanny how much actor Tom Wilson looks like Old Biff. But there is one difference - the Tom Wilson of today looks like the Biff of 1985, not the Biff of 2015. Way to keep it tight, Tom! 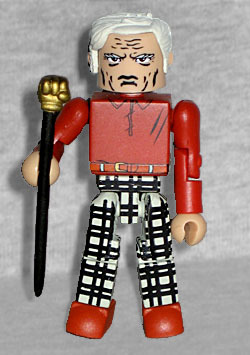 The figure comes with two accessories: his fist-topped cane, and Gray's Sports Almanac. Those are both perfect choices, but the almanac is the real star. They printed a copy of the actual cover on the accessory, despite its tiny tiny size. The only thing that would have been cooler is if they'd made their own cover, turning all the sportsmen into Minimates instead. These Minimates were released in 2008 (and were provided for us by Luke's Toy Store, before being turned into zombies). We're reviewing them in 2010, but most of you won't read this until 2015. The figures covered might be from 2015, 1985, or 1955. But whatever time they're from, today is their day.